Happy New year to all my friends and my visitors from all over the world. I pray and wish for a hearty and a healthy new year for all of us. Firstly I thought of opening this year's blog post with a sweet note but then u know me, I don't go as per plan and am bit more on the spontaneous side. The biggest advantage of staying here in Malaysia is you get almost ALL things you get back home which includes everything, seriously I mean everything. Also Malaysia is a tropical country and so you can find all the seasonal veggies, fruits almost same as we get in India. Agathi Keerai Thanni Saaru and Manathakkali Thanni Saaru is very famous in my hometown, Thanjavur. Amma makes it very often, she always makes sure to prepare this at least once in a week. Me and my brother used to have mouth ulcers during our school and college days. This was our immediate remedy after B-complex supplements. This greens possess many medicinal values. Google for it, u'll find out more. Off to the recipe now, forgot to click step wise clicks, will try to update soon. Pluck the leaves and rinse them thoroughly to clean the mud/dirt. Slit open the green chillies and cut the onions into thin slivers. Heat the oil in a sauce pan to fry the thinly sliced onions and the green chillies. Saute them for few seconds until they turn glossy. Add the kazhani (rice rinsed water) and salt. Give them a rapid boil. Drop the leaves and mix them thoroughly. Do not cover the pan. Let them cook thoroughly. In the meantime, grind the coconut with cumin seeds using hot water and extract the milk in a bowl. Filter the milk and gather the remaining in the mixie jar. Add more hot water to take the second milk. Grind again and pass it through a sieve to filter the second milk which is thinner milk in the same bowl. Mix the milk together using a spoon and keep it aside. Now if you look at the keerai/greens it should be cooked thoroughly. Switch off the flame. 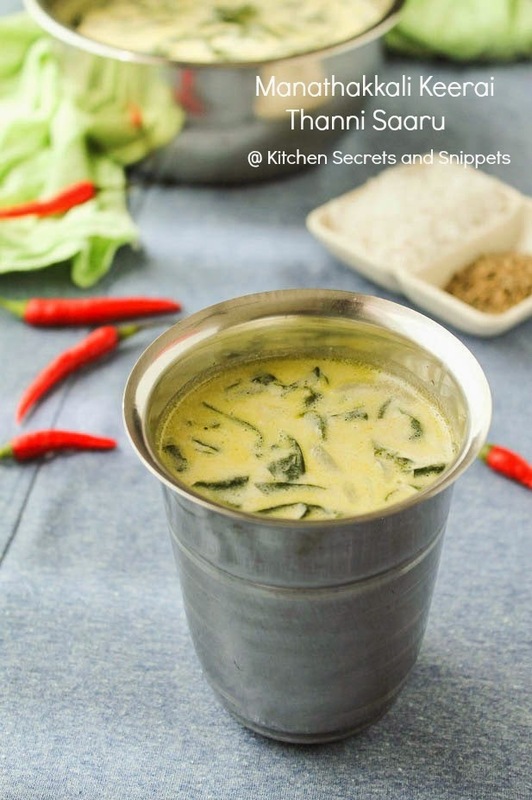 Remove the sauce pan from the heat and pour the coconut milk and give it a good mix. Cover the sauce pan for couple minutes. Later serve as such or with rice. Tastes OSM. Actual process involves adding of coconut paste which is a mixture of coconut and cumin seeds once the gas stove is switched off. I did not follow as I was planning to give it to my son, I adapted this method. This tastes extremely good even better than the original version as I've had countless experiences eating the traditional way. 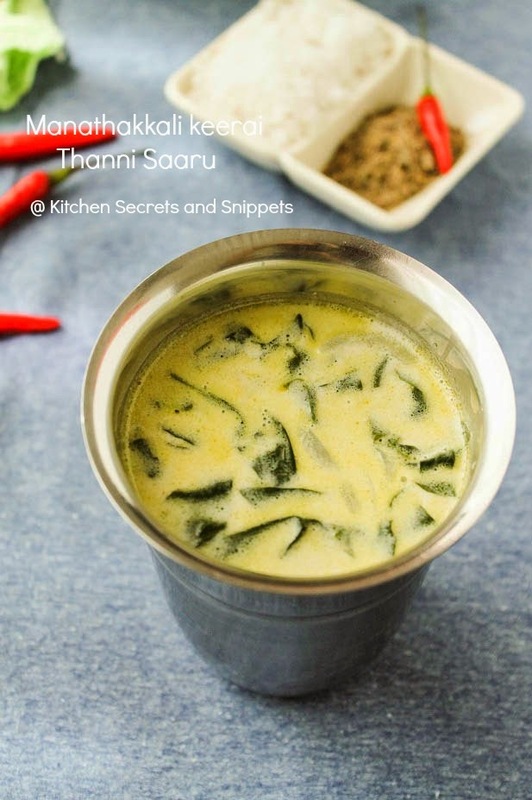 Make sure you cook the greens thoroughly before switching off the stove and adding the coconut milk. Sometimes these greens turns bitter after cooking. To avoid this, add only the greens and not the raw wonder berry u find in the stems. Also the coconut milk helps even out the bitterness and adds creamy texture to it. 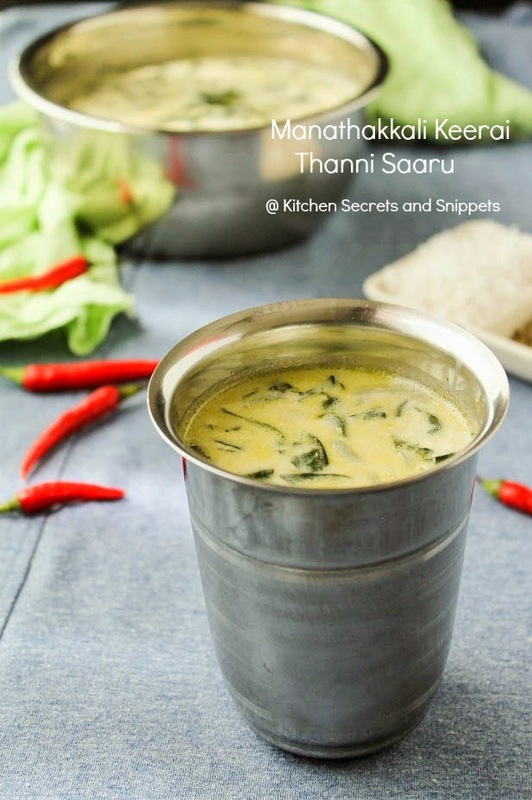 keerai saaru looks so inviting and delicious :) very comforting dish ! !